Many of our patients at Spring Lake Dental Care visit our office to address cracked, chipped, stained, or decaying teeth. Dr. Peter Ciampi and Associates offer a number of cosmetic dentistry options to help improve the look of your smile, and porcelain crowns provide an effective way to restore a healthy appearance to your teeth. These durable ceramic tooth restorations can help finalized a dental implant procedure or conceal imperfections while simultaneously adding structural support. A porcelain crown is designed to fit securely over a stained or damaged tooth, restoring the tooth’s proper shade and shape while reinforcing it at the same time. 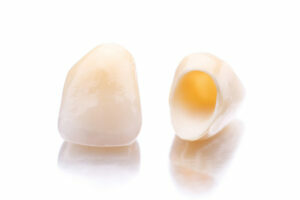 Unlike porcelain veneers, crowns cover the entire tooth and not just the visible portion. Before the ceramic crown is applied our cosmetic dentist, Dr. Ciampi, will eliminate any tooth decay and meticulously prepare the tooth to ensure a proper fit. After this preparation, you will be given a temporary crown to wear while your custom-designed permanent restoration is crafted. Once your final crown is ready, you will return to the office for a final fitting. This new crown should look and function like a natural tooth and, with proper care and maintenance, can last for many years. What Can Porcelain Crowns Do for My Smile? Porcelain crowns can enhance your smile by dramatically improving the appearance of chips, cracks, and deep stains with results that look natural. The color of your crown will be made to match the shade of your healthy teeth for a seamless, uniform smile. In addition to the cosmetic benefits, porcelain crowns can actually work to strengthen the tooth structure, restoring the health of your mouth and the integrity of your bite. Laser dentistry techniques are some of the most exciting advances in dental care, allowing patients to experience a more comfortable procedure and providing dentists with tools that are capable of incredible precision. At Spring Lake Dental Care, Dr. Ciampi and his experienced team utilize the ezlase™ 940 diode laser for a variety of procedures, including dental crowns and bridge treatments. The laser makes it possible to accomplish a number of treatments without the need for invasive dental tools. Laser dentistry can minimize bleeding and the risk of infection during the procedure, as well as reduce discomfort and the time needed for recovery. With the ezlase™ 940 laser system, our dental team can provide you with less invasive procedures to renew the health of the gums, restore the teeth, and have a more relaxing treatment.